Using identity to save and protect lives. 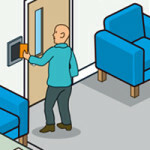 Managing access to wards and other secure areas for staff, patients and visitors. Use of patient IDs or insurance cards to contain health records. To verify medical staff, contractors, patients and visitors. 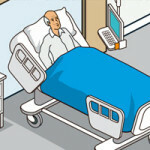 For staff to log on to medical equipment or patients to access services. 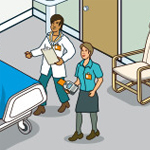 Both employee smart ID cards, patient ID and instantly issued visitor cards can be used to grant access to secure areas within a medical facility including ward access, associated with pre-defined visiting times. Access is typically granted using a card reader linked to a physical access control system (PACS). Learn more about Physical Access. The embedded electronic chip within patient ID smart cards or those issued by a health insurer can be used to store important information about the individual. As well as information about their health insurance scheme allowances, health-related information such as blood group, allegies and medications can be all be written to the card. This can be read at the bedside or in an emergency situation by a health professional equipped with an appropriate mobile card reader. Learn more about Data cards. Visual identity within a medical facility is important. Staff IDs reassure a patient who they are dealing with, patients need to be easily identified and only appropriate visitors should be granted entry to wards. ID cards with secure visual identity features such as a HoloKote watermark can facilitate this. 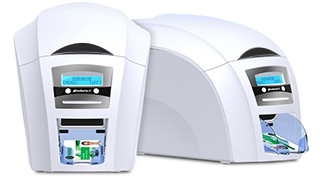 A desktop ID card printer at the reception desk can be used to instantly issue secure IDs to all incoming patients, contractors and visitors. Learn more about Photo ID’s. Smart cards encoded with appropriate electronic keys can be used to grant logical access to IT and medical equipment. For critical facilities, such as life-support, this could require multi-factor authentication including the smart card, a password and sometimes a biometric such as a fingerprint or iris scan. Patients can also use smart cards to access services such as TV, radio or Internet. Learn more about Logical Access.